The Hilton Barcelona hotel is an 11 floor modern building, refurbished in 2002 and surrounded by gardens and elegant shops. Location: The Hilton Diagonal Mar Barcelona Next to the hotel is the Barcelona International Convention Centre "CCIB" and the upmarket Diagonal Mar mall, which has 240 shops, cinemas, a hypermarket and a 5000 m² open air terrace with restaurants and leisure activities. Just 10 minutes from the city centre. The area has sports facilities, beach, and is next to the upmarket Diagonal Mar mall. 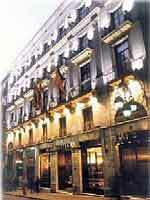 The Ciutat del Prat hotel is a modern newly built hotel (2001). The comfort and amenities of our rooms will make your stay a most pleasant one. The Gotico hotel is located in an historic building built in 1802 and completely renovated in 1999. It has more than 81 soundproofed rooms, some of which have a balcony.